Guests will have a chance to donate and win one of our multiple door prizes in a raffle all the while enjoying a fantastic fashion show! All donations given at the event will go towards the Arc of St. Lucie County. 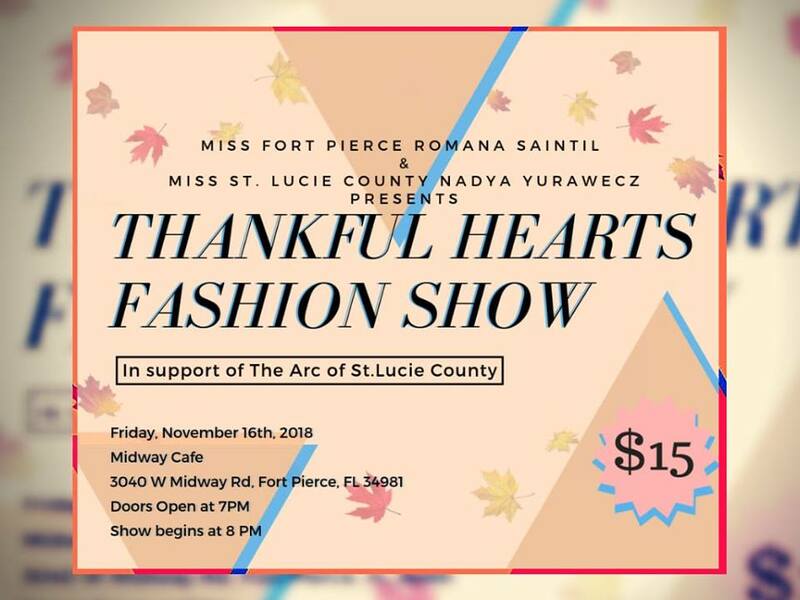 Thankful Hearts fashion show is being held by Romana Saintil (Miss Fort Pierce USA) and Nadya Yurawecz (Miss St. Lucie County USA) to raise donations in support of the Arc of St. Lucie County. The Arc of St. Lucie County Inc. is a Not-for-Profit, 501(c)3 charitable organization that began in Fort Pierce in 1954, working with people from age 5 and up with intellectual and/or developmental disabilities.